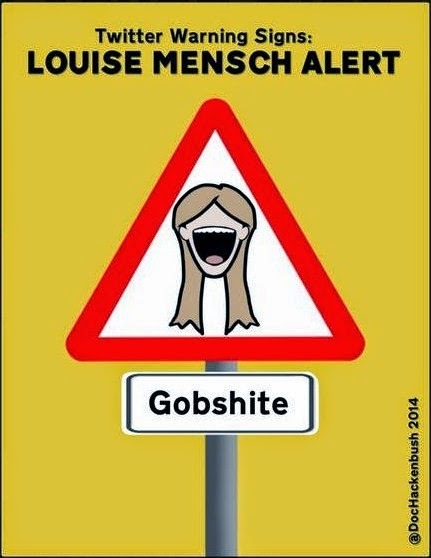 Demonstrating once again that the subs at the Super Soaraway Currant Bun don’t bother with fact-checking her column, (thankfully) former Tory MP Louise Mensch has been pontificating on the Jeremy Clarkson saga, only to fill her copy with totally untrue statements and a fantasy approach to workplace behaviour. But all is in accordance with the line laid out by Creepy Uncle Rupe. “The Clarkson sags doesn’t reflect well on anybody involved - except Richard Hammond and James May” she declares. This is down, supposedly, to their loyalty: “They stepped away from the BBC and the show that made their fortunes in order to support their pal Jeremy, saying ‘we come as a package’”. You didn’t know Hammond and May had left Top Gear? Neither did the BBC. Come to think of it, neither did they. What James May actually said (note that they were his words, not Richard Hammond’s) was that Top Gear would continue “in some way”, adding “I don’t want to talk about that too much. I think we’re very much the three of us as a package, it works for very complicated reasons that a lot of people don’t fully understand. So that will require a lot of careful thought”. That means he hasn’t made his mind up. Hammond has said “We're all three of us idiots in our different ways but it's been an incredible ride together”, which is equally inconclusive. So nobody has “stepped away from the BBC”. Never mind, though, Ms Mensch has another totally made up assertion ready and waiting: “this has led to the end of one of the BBC’s best shows”. Top Gear has finished? Did anyone tell the BBC? It hasn’t, of course. 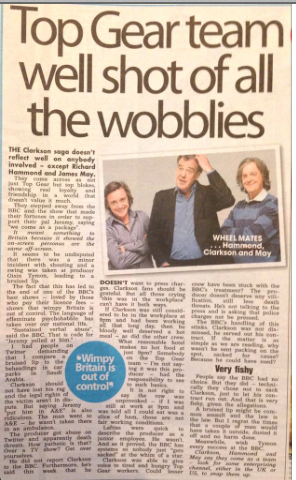 Readers are then treated to a number of creative excuses for Clarkson’s behaviour: he was somehow entitled to a hot meal, the hotel was not “reasonable”, producer Oisin Tymon’s cut lip was downgraded to merely “bruised”, Jezza was only giving “voice to tired and hungry Top Gear workers” (so tired of Jezza that they forced him to report the “fracas”), and they should have taken it outside, except only one party was abusive. But the Pièce de Résistance is held back for the end, as Ms Mensch assures readers “Clarkson, Hammond and May say they come as a team [no they don’t - see above] - look for some enterprising channel, either in the UK or US, to snap them up”. Who might she have in mind? How about Sky, with its Murdoch shareholding? 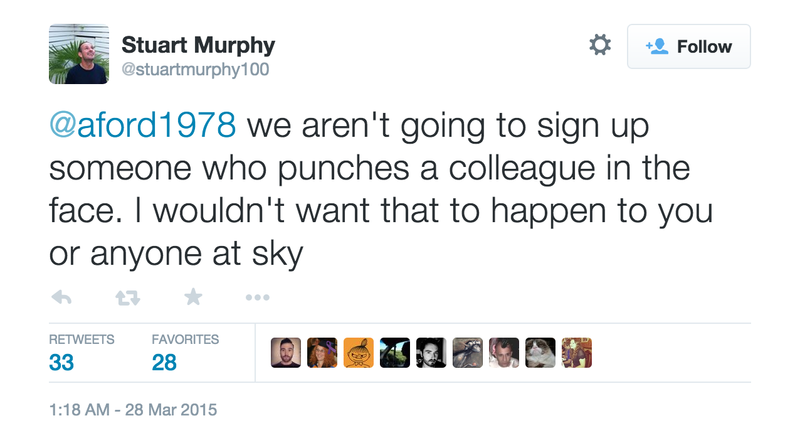 Stuart Murphy, who runs Sky’s entertainment channels, had this to say to the suggestion Jezza might be heading over there: “we aren't going to sign up someone who punches a colleague in the face. I wouldn't want that to happen to you or anyone at Sky”. What the utterly clueless Louise Mensch calls “a minor incident with shouting” has apparently reduced the number of enterprising channels considerably. The BBC had a sound case for not renewing Clarkson’s contract. His co-presenters haven’t gone anywhere yet. And Sky don’t want to know. Facts, eh Louise? Louise wouldn't know a fact unless it came and punched her in the face. The BBC already has another motoring programme with three presenters. Air An Rathad (On The Road). Clarkson, Hammond, and May might be less indispensable than they think. Although BBC Alba might not want to lose a Gaelic speaking programme. Yes, we can get to kick the Tories out after the election kerfuffle.